Monaco - The Wally 130 is a breakthrough sloop developed by Wally with the lines by Javier Soto Acebal. This stunning 130-foot (40-meter) mega yacht features the water ballast combined with the trim-tab lifting keel. The innovative movable ballast combination has been selected by Wally Research & Development department to optimise safety and performance in such a large yacht: the 11-ton (24,251 lbs) water ballast improves the stability of the light displacement boat (only 95 tons - 209,439 lbs) while the 6-meter deep keel with trim tab improves the lift. The draft can be reduced to 4 meters to allow the access to ports and bays. The deck is similar to that of Esense and is characterized by the bulwark leaving the hull lines pure while offering more privacy and protection. Furthermore, the bulwark amidships hosts on both sides part of the water tanks (the remaining extends down below). The stern features the so-called Terrace on the sea. The interiors accommodate eight guests and five crew. The aft salon opens onto the Terrace on the sea following the Wally inside-outside living concept first introduced with Tiketitan in 1998. The interior design is contemporary and is characterised by some strong architectural elements. The exterior styling reflects the high technology content of the mega yacht combining the metallic grey colour of the hull and coaming with the red PBO rigging and deck lightening. 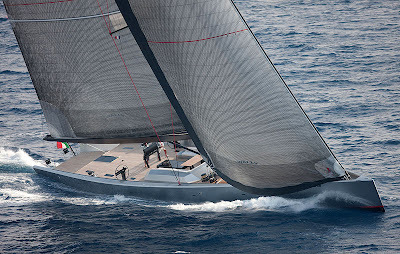 As a result, the Wally 130 stands out for performance and style: she was the star of the Voiles de Saint Tropez where she impressed spectators, media and competitors for her acceleration and upwind performance.